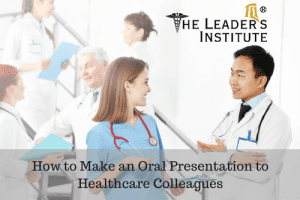 The custom public speaking class, How to Make an Oral Presentation to Healthcare Colleagues, helps healthcare teams communicate more confidently and efficiently. Although this program was specifically designed for our clients in the healthcare, pharmaceutical, and medical device industry, the program can be customized for any industry. The healthcare industry has specific challenges that are unique. For instance, because the industry is highly regulated, the message within each presentation designed and delivered tends to come under scrutiny. As a result, when we deliver presentations to healthcare colleagues, we will likely feel more anxiety and nervousness. Design more concise and informative presentations to their colleagues. Reduce the natural nervousness and anxiety from these presentations. Help participants develop confident presentation styles. One of the things about presentation delivery that is very common is that the more highly educated the audience, the more anxious the presenter will likely feel. The most common reaction that a presenter will have when preparing for a presentation in this industry is, "The audience is at such a high level, that they will be judging me!" While this reaction is common, the reality tends to be quite different. Presenters need to understand that they have information that it is important to deliver to their colleagues, and the better these presenter are at delivering this important content, the more successful they and their colleagues will become. That is why we created this great program! In addition, the content of this presentation class is tailored to every group. Our instructors can help you create the perfect solution for your team!